The US-trained Iranian Imperial Air Force was widely regarded as second only to Israel's in the Middle East - more than a match for Iraq and a serious adversary for even the Soviet Union. At its peak the Imperial Iranian Air Force, that of the Shah, had more than 450 modern combat aircraft, including then state of the art F-14A Tomcat fighters and about 5,000 well-trained pilots. On the eve of the Iranian Revolution in 1979 the Air Force, numbering close to 100,000 personnel, was by far the most advanced of the three Iranian military services and among the most impressive air forces in the developing world. Reliable information on the Air Force after the Revolution was difficult to obtain, but it seemed clear that by 1987 a fairly large number of the existing fleet had been cannibalized for spare parts. 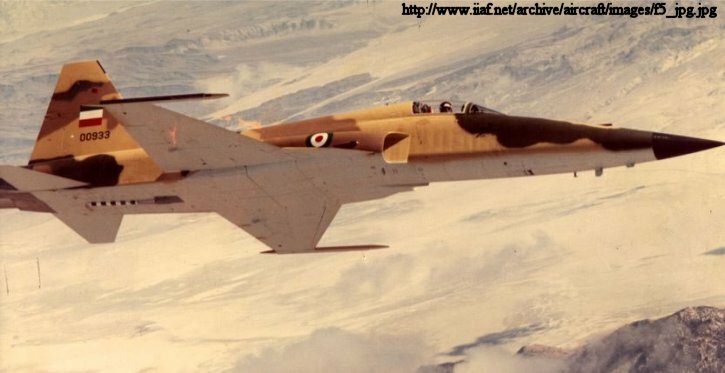 A total of 14 air bases were operational: Ahvaz, Bandar Abbas, Bushehr, Chan Bahar, Dezful, Doshan Tapeh (Tehran), Ghaleh Morghi (Tehran), Hamadan, Isfahan, Mashhad, Mehrabad (Tehran), Shiraz, Tabriz and Zahedan. Soviet and Chinese-made aircraft, obtained following the Iranian Revolution were distributed throughout the country to fufill mission roles of ground attack, transport, training and interception. Bandar Abbas, Bushehr, Dezful, Hamadan, Tabriz and Mehrabad became the centers for ground attack squadrons. Shiraz was the home of the interceptor squadron. It also provided training along with, Mehrabad, Doshan Tapeh and Isfahan. Shiraz also housed the transport squadron. Air Force headquarters was located at Doshan Tapeh Air Base, near Tehran. Iran's largest air base, Mehrabad, outside Tehran, was also the country's major civil airport. Other major operational air bases were at Tabriz, Bandar-e Abbas, Hamadan (Shahroki Air Base), Dezful (Vahdati Air Base), Shiraz, and Bushehr. Since 1980 air bases at Ahvaz, Esfahan (Khatami Air Base), and Bandar Beheshti had also become operational. The Air Force's primary maintenance facility was located at Mehrabad Air Base. The nearby Iran Aircraft Industries, in addition to providing main overhaul backup for the maintenance unit, was active in manufacturing spare parts. Before the Revolution, the Air Force was organized into 15 squadrons with fighter and fighter-bomber capabilities and a single reconnaissance squadron. In addition, 1 tanker squadron, and 4 medium and 1 light transport squadron provided impressive logistical support. By 1986 desertions and depletions led to a reorganization of the Air Force into 8 squadrons again with fighter and fighter-bomber capabilities and 1 reconnaissance squadron. This reduced force was supported by 2 joint tanker-transport squadrons and 5 light transport squadrons. Some 76 helicopters and 5 surface-to-air missile (SAM) squadrons supplemented this capability. From its inception, the Air Force also assumed responsibility for air defense. The existing early warning systems, built in the 1950s under the auspices of Central Treaty Organization (CENTO), were upgraded in the 1970s with a modern air defense radar network. To complement the ground radar component and provide a blanket coverage of the Gulf region, the United States also agreed to sell Iran 7 Boeing 707 airborne warning and control system (AWACS) aircraft in late 1977. Following the Revolution, Washington canceled the AWACS sale, claiming that this sensitive equipment might be compromised. Finally, the Air Force's 3 SAM battalions and 8 Improved HAWK battalions were reorganized in the mid-1980s (in a project involving more than 1,800 missiles) into 5 squadrons that also contained Rapiers and Tigercats of British origin. Washington's sale of HAWK spare parts and missiles in 1985 and 1986 may have enhanced this capability. Today the Islamic Republic of Iran Air Force is representative of a handful of countries worldwide that have a moderately sized force utilizing some elements of technology that enhance their lethality and/or survivability. It is a hodge-podge of aircraft and capabilities resulting from multiple conflicts and previous military acquisitions. Its composition, including previously exported US fighters, is somewhat unique in regards to the potential threat facing the US. Another significant portion of their fleet is remnant of the Gulf War in 1991, with multiple Iraqi aircraft acquired as defectors during the conflict. None of these aircraft included any maintenance or replacement parts and are questionable in their operation. Iran is in constant contact with the Russian military industry and is suspected of attempting to acquire modern fighters. In addition to Russia and Belarus, Iran trades military technology with China, North Korea and even Brazil, potentially bolstering their older air force with newer equipment. Not much is known openly about these capabilities and it is difficult to believe what is released. However, it was clear as of mid-2014 that Iran had not received any new fighter aircraft and had not produced any internal to Iran. While Iranian territory is large, it is usually concluded that most of their fighters are deployed around their strategic centers of gravity, specifically around Tehran and Esfahan. A potential aerial battle might take place on the outer perimeters of this central region, consisting of the number of the Iranian forces that are operational.